String art projects for geometry use a technique known as curve stitching, which creates circles and curves from straight lines. According to the Agnes Scott College website, Mary Everest Boole, a British educator and author, invented this technique to enable children to comprehend the mathematics of angles and spaces. Using string, thread or floss, children can begin stitching angles and then graduate to more complex circles and triangles. Gather a ruler, needle, scissors, push pins, small carpet squares, thread and a 6” square poster board. Draw an angle, such as right, acute or obtuse, on the poster board. Make sure the arms are of equal length. Mark each arm in 1/2-inch increments. Slide a carpet square under the board so you can prick holes into the board with the pins. Number the marks, starting with #1 on one arm located at the angle’s vertex. Reverse the numbering on the other arm so that you end with the highest number on the vertex. Thread the needle and knot the end. Wind the string around #1 on the bottom arm, coming up to #1 on the other arm, then coming down to loop around #2 on the bottom arm and so forth. This basic advancing weave will result in a smooth Belzier curve. Use a compass to draw a circle on a 6-inch-square poster board. Use a protractor to mark the circle’s circumference into equal parts of either 5 or 10 degrees. Slide a carpet square under the board. Use a pin to make a hole at each mark on the circumference. Number the holes, starting with #1 at the topmost hole. Thread a needle. Pull the thread through hole #1 and stitch across the circle to any other hole, such as hole #6. Move to the next hole, or hole #7. Stitch back to one hole from where you started, or hole #2. Move over one hole to hole #3, and then stitch over to hole #7. Repeat this procedure until you finish the circle. The succession of equal chords will forge a concentric circle within the drawn circle. Create a circle burst as you grow more familiar with stitching techniques. Use the same setup as you would for a circle, except run a thread from a pin placed in the center of a circle to every pin along the circle’s perimeter. Knot the thread around the center pin to start. Loop the thread around the topmost perimeter pin and then wrap it around the center pin. Wrap the thread clockwise around the second pin and return the stitch to the center pin. Continue until you have wrapped all of the pins along the perimeter. Push the string around the center nail down so that each new loop falls on top of the last. Gather push pins, foam board and spool of thread. Use a compass, ruler and pencil to draw 21 equidistant radial lines that form a ring on tracing paper. Place the design on the board. Mark and pin 21 points at the end of the lines, then pull the paper off. Knot the end of the threat around the top pin, which is zero on the count. Move clockwise to the next pin, or the first of ten steps in each round, and wrap the thread around the pin. Each time you wrap a pin, you have a new starting point. Count for 2 pins, and loop the thread around the end pin. Count for 3 pins and wrap the end pin. Repeat this procedure for the counts of 4 to 10. Start the next 10-step round from the pin you landed on in step 10 of the first round. Repeat all ten steps for each pin on the perimeter of the circle, or 21 times. Knot the thread on the final pin to complete a complex 21-sided polygon, or the icosihenagon. Tang, Kay. "String Art Projects for Geometry." 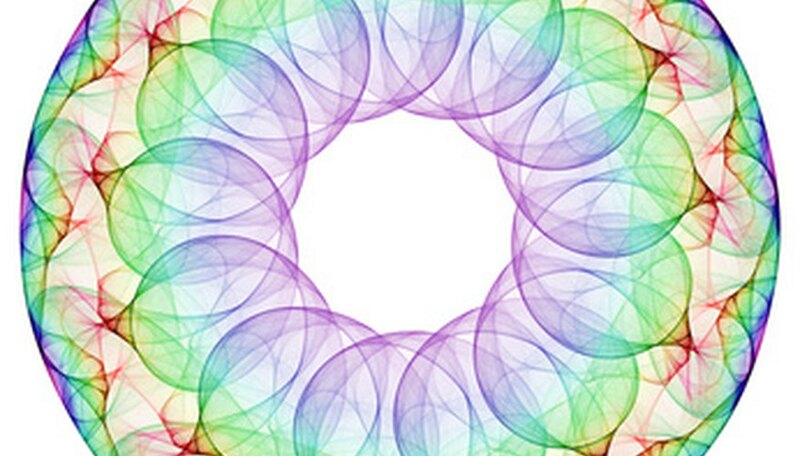 Sciencing, https://sciencing.com/string-art-projects-geometry-7902238.html. 25 April 2017.